How do you define company culture? Every company, no matter its size, number of employees, industry, or location, has a culture. 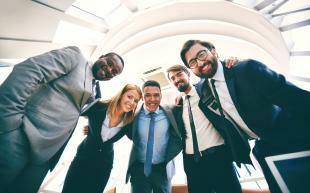 As William Craig explains in an article for the Forbes blog, company culture isn’t something employees bring with them. Rather, it’s “something that is pre-existing in your company’s genetic code.” Yet, even with Craig’s description, company culture can be hard to grasp. To fully define company culture, you must examine all the attributes that contribute to the environment of the company, including values, norms, ethics, language, belief, habits, and more. For example, here at OpenSesame, continued learning and education is integral to our company culture. Different employees host weekly “Lunch and Learns” to educate fellow employees on everything from email etiquette to body language in the workplace. OpenSesame’s learning-focused culture informs our larger mission as an elearning and online training company and reinforces the culture, values, and personality of the company. 1. What is the employee turnover rate? Before signing on to work at a new company, make sure you have a sense of employee happiness and satisfaction. Asking about the turnover rate, or the percentage of employees who leave the company in a certain period of time can help you gather a sense of how frequently employees are staying with the company or leaving it. 2. What do day-to-day operations look like? Gaining a sense of what an ordinary day looks like at a company can help you understand the operational and organizational flow. Are employees collaborating in teams in an open-office environment, or seated in separate cubicles? How frequently are there company-wide meetings? What does the daily workflow look like? These questions about daily office life can help you gain insights into the environment and larger culture of the company. 3. What are relationships like between departments and management? Part of company culture is the relationship structure between employees, departments, and management. Some companies favor a hierarchical, top-down model of leadership, while others may favor softer lines of distinction between employees and supervisors. Don’t be embarrassed to ask about relationships and operations at a potential company. 4. How does this company engage employees? Employee engagement is another crucial element of company culture, yet determining it before signing on to work at a company can be difficult. Consider asking about the company’s effort to engage their employees, perhaps through extracurricular activities such as educational lunch meetings, or through motivational or leadership training. 5. Does this company place an emphasis on continued learning? Determining whether or not a company will foster your continued learning and professional development reflects back upon their underlying values and mission. Continued employee education and learning can contribute to not only company culture, but also the engagement and happiness levels of employees. Company culture is a complex issue and is worth investigating by speaking with colleagues, asking relevant questions, and researching on your own. Try asking any of these questions in your next interview or dialogue with fellow colleagues about company culture at your office!